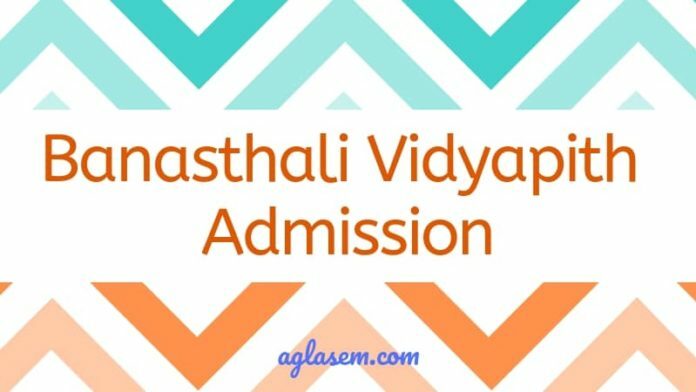 Banasthali Vidyapith Admission 2019 – The admission in the women-only college, in the state of Rajasthan, is now open. The application form for admission in 14 departments is now open. 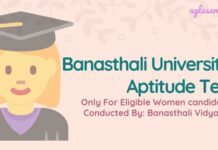 Only eligible women candidates are eligible to apply for Banasthali Vidyapith Admission 2019. The admission is made on the basis of Banasthali Aptitude Test for some courses. While for the other courses the admission mode is directly based on eligibility and qualifying exam marks. Know all about Banasthali University Admission 2019 like application process, eligibility, entrance test, fees, courses, etc. 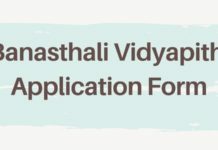 The application form to apply for Banasthali Vidyapith Admission 2019 is available over the official website of Banasthali University. In addition to that, candidates can also get the form from the university’s campus by paying the application fee in cash or by sending a DD fo the requisite amount at the University. The candidates have to visit the direct link on this page above or visit the official website of the university. On click it the application form opens. There the candidates have to fill all the details correctly and submit the form. Finally, the candidates have to make the payment of the application fee in the online mode to submit the application form. The admission in most of the courses for admission in the University is based on the aptitude test that the university conducts. The exam pattern for all the courses is different. The test is compulsory and the candidates failing to appear in the test are not eligible for the test. Click here for the details of eligibility criteria for higher education. Group A1: MBA, MCA, M.Pharm., M.Tech., M.Des., B.Tech., B.B.A., B.C.A., L.L.B. (Integrated), B.Design, B.Pharm., LL.M. – Rs. 99,000/- p.a. Group A2: M. Sc., M.Com., Master of Social Work, B.Sc., B.Sc. (Aviation Science)*, B.A. (Journalism and Mass Communication), B.Com.,B.A. B.Ed. (Integrated), B.Sc. B.Ed. (Integrated), B.Sc. (Nursing) – Rs. 71,000/- p.a. Group A3: B.A., M.Phil., M.A., M.Sc. (Home Science), B.Sc. (Home Science), B.Ed., M.Ed – Rs. 44,000/- p.a. Note: Regular fee for Foreign/NRI/NRI sponsored applicants:- For Group (A1) courses: US Dollar $ 3,850 p.a. , For Group (A2) courses : US Dollar $ 2,875 p.a. and For Group (A3) courses : US Dollar $ 1,900 p.a. 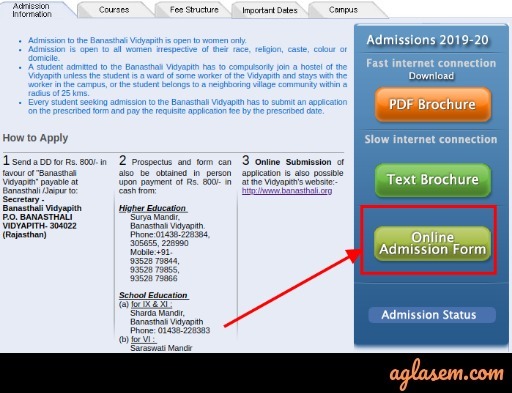 Re-admission – If a student is separated from Banasthali or Shri Shantabai Shiksha Kutir and in the event Vidyapith decides to readmit her, the admission fee of Rs. 5,000/- shall be payable. The admission of a student shall be automatically cancelled due to the unauthorized absence of three days or more. Absence without prior written permission from the Vidyapith shall be treated as an unauthorized absence. Sample papers of Aptitude Test for class 6 & class 9 are available now. Candidates can download the sample papers from the links provided below. Candidates are advised to prepare for the exam by attempting these papers. Click Here to check/download the sample paper for class 6. Click Here to check/download the sample paper for class 9. Banasthali is one of the five universities in India meant exclusively for Women. Over these seventy-five years, Banasthali has developed into a National Centre for women’s education. Banasthali’s educational programme aims at an all-round development of the student’s personality. To achieve its objective of ‘synthesis of spiritual values and scientific achievements of the East and the West’, it has evolved Five-fold Educational Programme (Panchmukhi Shiksha) comprising of the following aspects : (i) Physical, (ii) Practical, (iii) Aesthetic, (iv) Moral and (v) Intellectual. This way the students develop an integrated and balanced personality. The academic activity of the students will be strictly guided by the Academic rules and decisions taken by Academic Bodies from time to time. Admission of married students shall not be possible in any other courses except to the postgraduate courses. In post-graduate courses too, on very special circumstances only, the married students will be provided admission. After being admitted to courses, if a student gets married before attaining the age of 18 years, her admission shall be canceled from the Vidyapith. Admission will be open to all women irrespective of their race, religion, caste, color or domicile. Under extraordinary circumstances, the Vice-Chancellor, with the approval of the President can relax any condition except the minimum eligibility, but all such cases will have to be placed before the Executive Council for concurrence. For more details about Banasthali Vidyapith Admission 2019, download brochure | Admission Notice.